Mangrove forests are distributed throughout the tropical and subtropical coasts of the world. Although there is some overlap they can be seen as replacement of the mud flats of the temperate and polar coasts. Like salt marshes and mudflats mangroves are intertidal and rarely extend below mean tide level. Worldwide there about 60 mangrove species exist, the diversity of these treesspecies is relatively low. Unique is the fact that mangrove habits have evolved at least 16 times in 16 different families of trees. As with corals and seagrasses the highest diversity can be found in the Indonesia - New Guinea - Australia region. More marine organisms can be found in mangroves than one would expect in such muddy areas. The roots of the trees form an hard substrate for organisms which is absent in typical muddy shores. 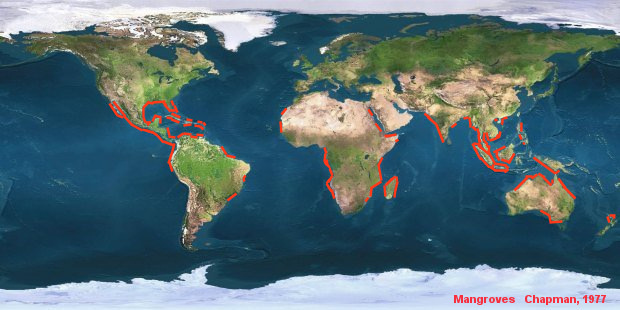 Many species of sponges, molluscs, crabs, shrimps and fish live in these area's. 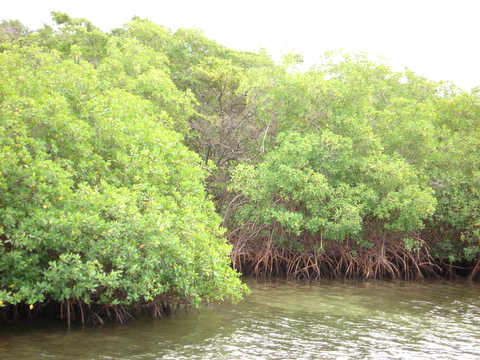 Apart from the marine species also many terrestial species live in mangrove trees. Mangroves are unique. On one hand many terrestrial species may live in the trees. On the other hand marine species attach on the roots of the trees or live in the mud below. Here we'll concentrate on the marine species. Many species attach on the roots and feed themselves by filtering food particles out off the surrounding water. In other groups like snails and crabs individual species may have quite different feeding habits. Some species live on the roots and climb down to eat organic particles on the mud. Other species normally live between the roots as well but eat from the roots, leafs or seeds of the trees. Mangroves are known to be nursery grounds for a variety of fish and crustaceans. Recent reseach showed that mangroves in the Caribbean serve as juvenile habitats for many coral reef fishes whereas those in the Western Indian Ocean don't seem so important in this respect. Many shrimp, crab, and lobster species start off their lives in mangrove areas and move to deeper water when they get older. More than a third of all mangroves in the world have disappeared, with a rate of loss greater than that of tropical rainforests. Greatest natural causes of large scale mortality are typhoons or hurricanes and tsunami's. These causes have their impact but the great decline in mangroves must be attributed to humans. 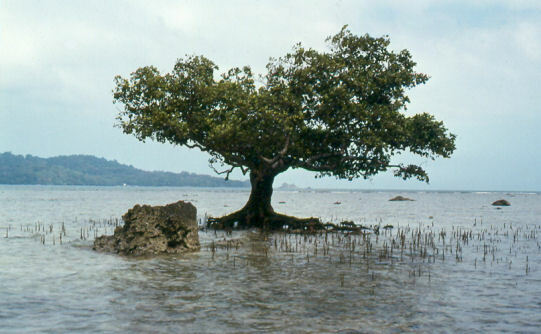 Mangroves in the tropics are heavily exploited whereby human threats vary in different parts of the world. Logging for firewood and charcoal have their impact for a long time. Historically mangrove forests probably occurred in the Persian gulf but now are absent due to cutting by early humans for firewood and wood for boats. Also draining for land development (particularly for tourism) is an important factor. But globally as much as 50% percent of mangrove destruction in recent years has been due to clear cutting for shrimp farms.